One of the corruptions that can stymie all efforts at disaster recovery is broken boot page. If the boot page can’t be processed, the database can’t be brought online or even put into emergency mode. I first demonstrated how to work around this in my session on Advanced Data Recovery Techniques at PASS in 2014 and here I’d like to walk through the steps of what to do. 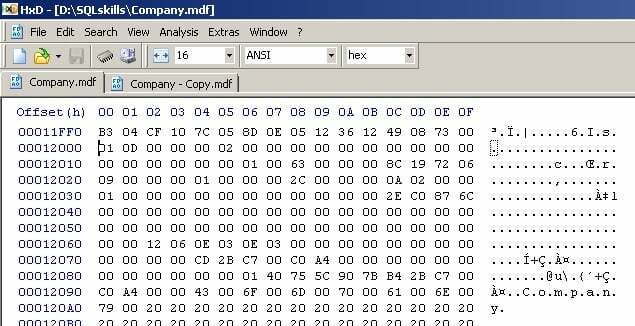 Now I’ll corrupt it using a hex editor. The one I like to use is called HxD and it’s a freeware tool you can download from here. And then go to the offset of the boot page. 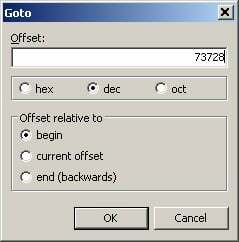 It’s page 9 always, so the offset is 8192 x 9 = 73728. Then hit the disk icon to save the file. Ignore any security errors you get about the ownership of the backup file. 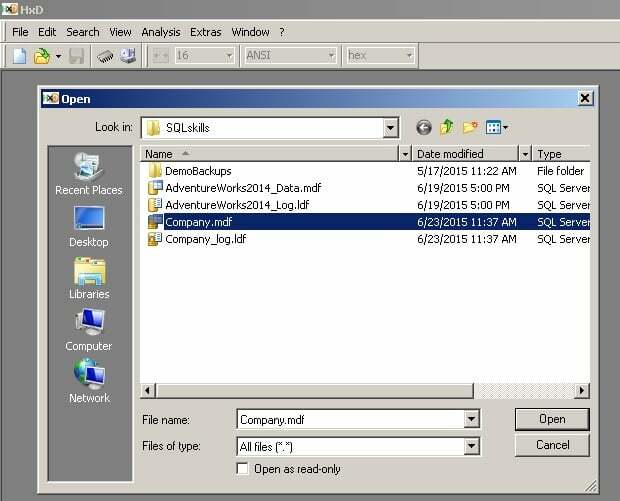 Throughout the rest of these steps, if you get “Access is denied” from SQL Server, you need to change the security in the directory you’re using so the SQL Server service account has the correct file permissions. 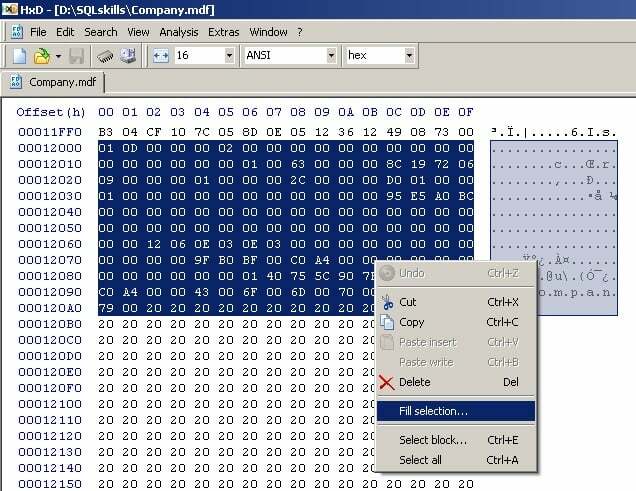 You will also see different messages through some of these steps depending on which version of SQL Server you’re using – I’m using SQL Server 2014. Now we’re ready to try to salvage this database. Could not open new database 'Company'. CREATE DATABASE is aborted. 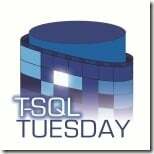 SQL Server detected a logical consistency-based I/O error: incorrect pageid (expected 1:9; actual 0:0). 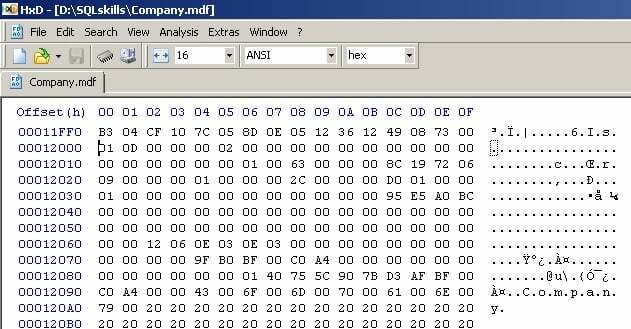 It occurred during a read of page (1:9) in database ID 6 at offset 0x00000000012000 in file 'D:\SQLskills\Company.mdf'. 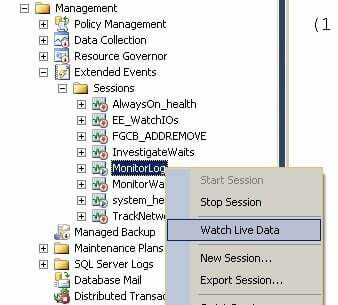 Additional messages in the SQL Server error log or system event log may provide more detail. This is a severe error condition that threatens database integrity and must be corrected immediately. Complete a full database consistency check (DBCC CHECKDB). This error can be caused by many factors; for more information, see SQL Server Books Online. The attach failed. You can verify this yourself by looking in sys.databases for the database – it’s not there. Could not restart database "Company". Reverting to the previous status. Hmmm… but did it work? Nope – it’s not going to work because the broken boot page won’t allow the database to be accessed at all. 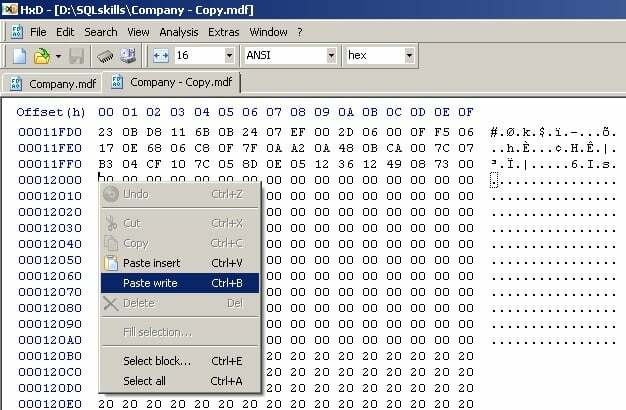 Now we’ll fix it, again using a hex editor. First off I’ll set the database offline again, copy off the broken files, and drop the database so it’s gone from SQL Server. And you can see that the boot page is intact in the restored copy. 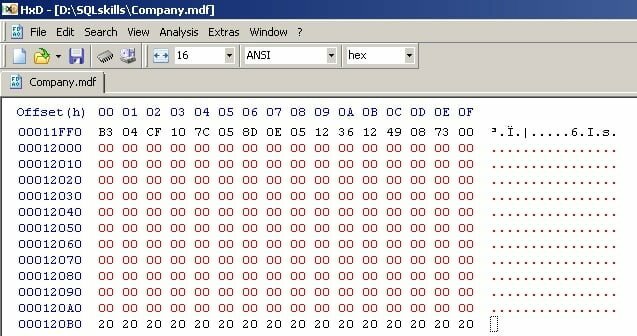 Next, I’ll highlight from 12000 (hexadecimal) down to, but not including, 14000, and then right-click and hit Copy to copy the whole 8192 bytes. These offsets are the same in every database. Now save the file and exit HxD. Delete the restored files, and rename the corrupt files to their correct names. You’ll notice that HxD created a backup copy of the file we just changed – you can ignore it. The log scan number (45:16:0) passed to log scan in database 'Company' is not valid. This error may indicate data corruption or that the log file (.ldf) does not match the data file (.mdf). If this error occurred during replication, re-create the publication. Otherwise, restore from backup if the problem results in a failure during startup. An error occurred during recovery, preventing the database 'Company' (6:0) from restarting. Diagnose the recovery errors and fix them, or restore from a known good backup. If errors are not corrected or expected, contact Technical Support. Good – the 824 message is gone, but now you can see we have another issue: all the LSNs in the boot page are incorrect now as we’re now using an older boot page that doesn’t match the more recent transaction log. Emergency mode and/or emergency-mode repair is necessary to either access the data or repair the corrupt database. Warning: The log for database 'Company' has been rebuilt. Transactional consistency has been lost. The RESTORE chain was broken, and the server no longer has context on the previous log files, so you will need to know what they were. You should run DBCC CHECKDB to validate physical consistency. The database has been put in dbo-only mode. When you are ready to make the database available for use, you will need to reset database options and delete any extra log files. In this case there were no other corruptions, so all emergency-mode repair had to do is rebuild the transaction log. Now we can get in to the database and access the data. Note: the data is likely to be transactionally inconsistent. If you continue to use the database in production following this procedure, you do so entirely at your own risk. If you don’t have a backup of the original database, you can use any database as a source for a good boot page – just make sure it has the same name as the one you’re trying to fix. Bear in mind that the further away from a recent backup of the original database, the more trouble you’ll have trying to get crash recovery to work. And there you have it – no longer do broken boot pages have to curtail data recovery efforts. We’ve released our Fall lineup of classes for registration!